The world renowned Jang Dong Gun and Song Seung Heon are powerless in front of “Gag Concert”. 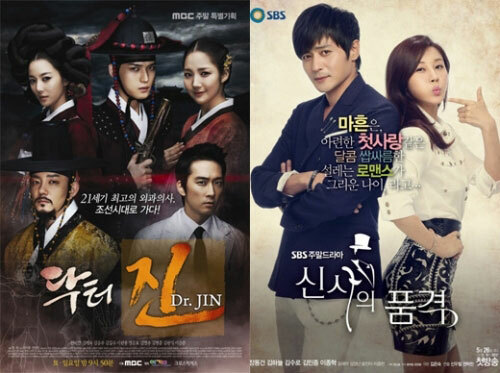 SBS weekend drama “A Gentleman’s Dignity” and MBC weekend drama “Dr. JIN” show the downward trend after broadcasting just 2 episodes, while KBS2 variety show “Gag Concert” shows its majesty of weekend winner. According to AGB Nielson Media Research agency, “A Gentleman’s Dignity” aired on the evening of May 27th, 2012 rated 12.8%, the rating which fell by 1.3% from premiere episode. The audience rating for “Dr. JIN” was 11.8%, dropping 0.4% from 12.2% of premiere episode. The strong lineup of Jang Dong Gun and Kim Ha Neul of SBS’s “A Gentleman’s Dignity”, and Song Seung Hun, Lee Bum Soo, Kim Jaejoong and Park Min Young of MBC’s “Dr. JIN”, coupled with the fact that these two dramas have been highly anticipated prior to broadcast, and that they both received praises in the premiere episode, but both dramas suffered drop in viewership ratings on 2nd episode. Meanwhile, KBS2’s “Gag Concert” shows off its strong power. “Gag Concert” on the evening of May 27th, 2012 which part of the broadcast timing was overlapping with the drama, achieved the rating of 19.9%, an increase of 0.3% over the last week.